Chair in the Shade: Feeling Cranky? I had a work meeting on Tuesday morning. Tuesday was also my day off, so I resolved to go to the morning session at 7:30 and get it over and done with. I got up and through on some decent clothes and headed in to work about six hours after I had gone to bed to the night before. The meeting felt like a waste of time. (They call them Monthly Staff Meeting- but it's really just a chance for the bosses to tell us what they're changing in the coming month.) I left feeling tired and unheard. That started my day in a funk that continued through. Things that normally would have been a small inconvenience had me on the verge of tears and everything felt extremely frustrating. So I compiled a list of ways to beat that cranky feeling. I did some of these, and some helped a little, but ultimately #10 did the trick. Take a walk. If you're at work, go on your lunch or break, if you can't and you work in an office, hand deliver something to someone outside of your department. If you're carrying an interdepartmental envelope, people tend to let you be. There's plenty of times I need to get away, and I hand deliver something instead of emailing it, or go to the central supply area to get something instead of calling them to bring it up. Walk. It's good for your body and brain. Give yourself a treat. This doesn't mean eat whatever you want, but if you can buy a small ice cream or a latte without feeling guilty- do it and savor it. A little treat may be just what you need. If you don't want to reward yourself with food, buy a new lip balm or a book or something to look forward to. Write it down. Just dump the words on the page. 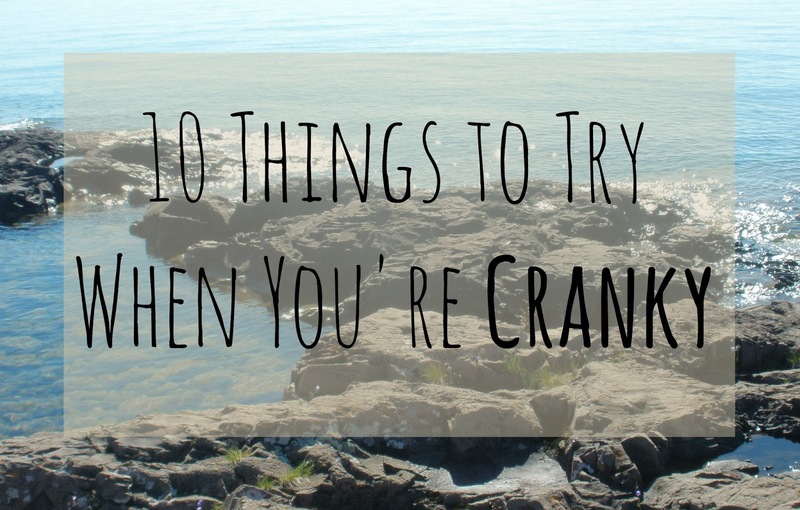 Why are you cranky? What's at the root of the feelings. No one else has to see what you wrote and if you're embarrassed by your words, you can always throw them away later. Pray about it. A lot of times I think praying just helps me feel less stressed and that if someone is annoying me, it's not really that major in the grand scheme of things. Do something nice for someone. Hold the door for someone, say hi to a stranger, make eye contact and smile. If you're feeling really ambitious, you can try paying it forward by buying someone's lunch in line behind you, or leaving a big tip for a waitress. It's hard to feel cranky when you're making a point to do nice things for others. Get outside. Go to a park and sit and listen to the birds. Or have a cup of coffee on your front steps. Watch the moths and butterflies. Pay attention to the squirrels. Just enjoy some nature. Take a nap. I find that this one usually helps a lot. Organize. Put that anger to good use. I took all my food items out of the cupboard Tuesday and threw out anything that was expired, and reorganized the baking supplies, teas, coffees, and pantry. I felt much better when it was done. Just go to bed. Even if it's early. Sometimes, the best thing you can do, is go to sleep and trust that you'll wake up feeling recharged and refreshed. What's your secret for getting over those feelings of annoyance and crankiness?